To work within a window in OS X El Capitan, the window must be active. The active window is always the frontmost window, and inactive windows always appear behind the active window. Only one window can be active at a time. To make a window active, click it anywhere — in the middle, on the title bar, or on a scroll bar. It doesn’t matter where; just click anywhere to activate it. The exceptions are the Close, Minimize, and Zoom buttons on inactive windows, which always do what they do, regardless of whether a window is active or inactive. 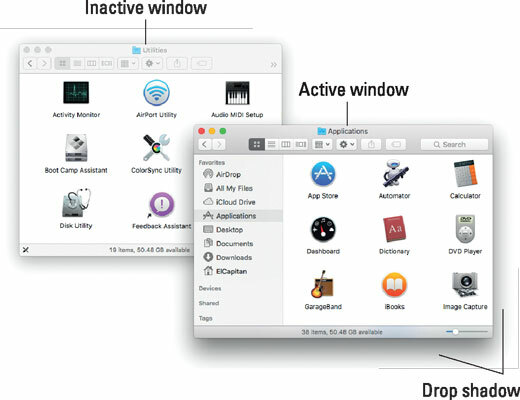 Look at this figure for an example of an active window in front of an inactive window (the Applications window and the Utilities window, respectively). An active window in front of an inactive window. The active window’s title bar: By default, the Close, Minimize, and Zoom buttons are bright red, yellow, and green, respectively. If you chose the Graphite Appearance in the General System Preferences pane, they’ll be dark gray; the inactive windows’ buttons are light gray regardless of Appearance settings. This is a nice visual cue. Colored items are active, and gray ones are inactive. Better still, if you move your mouse over an inactive window’s gumdrop buttons, they light up in their usual colors so you can close, minimize, or zoom an inactive window without first clicking it to making it active. Neat! The active window’s toolbar: Toolbar buttons are darker and more distinctive; the inactive window’s toolbar buttons are light gray and more subdued. The active window’s drop shadow: Notice how the active window has a more prominent shadow? This tricks your eye into thinking the active window is in front of the inactive one. One last thing: If you’re wondering how to resize a window, just hover the cursor over a window’s edge or corner or over the dividing line between two panes in the same window (such as the Sidebar and the main area of Finder windows). A helpful little arrow appears as a visual cue that you can now drag the edge, corner, or dividing line to resize the window or pane.